Need a live chatbot on a budget? 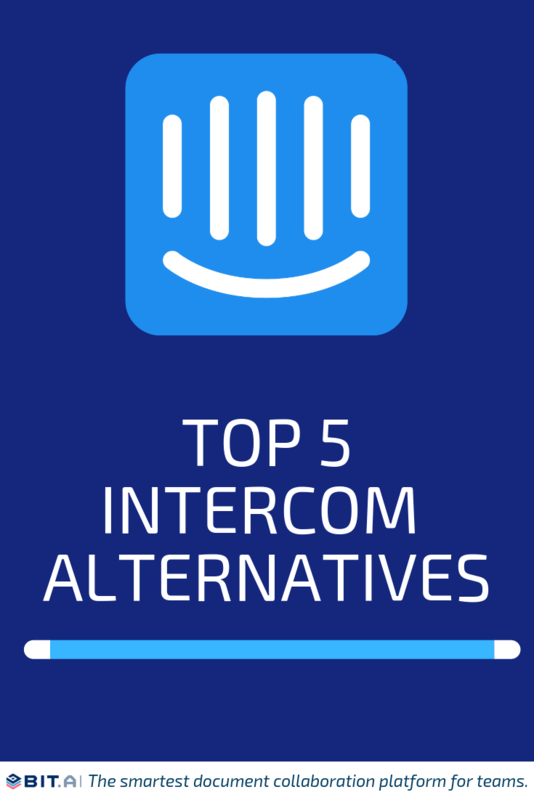 Check out these top Intercom alternatives. The 2017 Dimension Data Global CX Benchmarking report says 84% of organizations working to improve CX (customer experience) see an increase in revenue. A recent NewVoiceMedia survey reveals companies lost $75 billion in 2017 from customers switching to competitors due to bad customer service. This figure is up from $62 billion in 2016. According to the 2017 State of Global Customer Service Report, 54% of customers have higher expectations for customer service today compared to one year ago. We can go on and on, but I think you got the point! As technology matures and our world gets increasingly connected and transparent, customers are now able to see whether they are getting the best customer experience and where to switch if their expectations are not met. This growing need to provide unmatched and top notch customer service has given birth to many customer service platforms. Leading the pack is the one and only, Intercom. Did you know that more than half of US customers prefer to resolve their issue through web-chat instead of calling the customer care handle? Being aware of the usefulness of chatbots and live web chat, businesses are looking to deploy customer messaging solutions on their websites and apps quickly. In fact, by the year 2021, 50% of enterprise companies will spend more on bots and chatbot creation than they will on traditional mobile app development. You must have seen many websites with a chat bubble, mostly on the bottom right corner, ready to solve your queries or requests. More often than not, the chat service is powered by Intercom. Founded in 2011, Intercom is a leading customer communication platform that helps companies study and personalize their interactions with customers and allows them to send highly personalized and targeted messages. It has a suite of integrated services to help teams regardless if they are involved in sales, marketing, and customer support. Intercom allows businesses to track and understand their customer behavior. Send in-app messages to your users based on their behavior and strike a conversation. Incredibly easy and simple intuitive message editor that allows you to build message templates in minutes. A/B testing to improve your email, push and in-app messages performance by testing variants. As of October 2018, Intercom has 30,000 paying customers including big names like Microsoft and Spotify! But is it the only customer service platform out there? Not by a mile! According to a Gartner report, conversational marketing will be a recognized channel of B2B and B2C customer engagement and revenue, displacing a combination of marketing, sales and service activities by 2020. Drift wants to be at the forefront of this conversation marketing revolution. Instead of traditional marketing and sales platforms that rely on forms and follow-ups, Drift connects your business with the best leads in real-time. One of the best Intercom alternatives on this list, Drift makes use of bots to do your work for you. The Drift bot assistant qualifies visitors from your site, and then automatically directs them to individual sales reps and books meetings. With over 150,000 customers worldwide including companies like Marketo and Zenefits, Drift is a worthy Intercom alternative. Pricing: Free, Standard: $50/month, Pro: $500/month. A multichannel live chat for customer service and online sales. Chat.io was designed to make the most of every chat with the minimum effort on your side. It learns from your conversations, automatically suggests responses and speeds up your service. Even though it doesn’t offer a free plan, it does offer a 14-day trial period where you can check out the platform and see if it fits your business needs. Chat.io acknowledges the fact that your customers are present on many communication platforms: social media, email or SMS. Thus, with chat.io you can chat with them in real-time directly from the app, no matter what platform your customers are using. If you have absolutely no budget for a live customer messaging platform, Tawk is the tool for you. Tawk wants you to never have to pay for live chat software again as it provides all the basic features of a customer messaging platform for free! If you are looking for a catch, you might be disappointed as there isn’t any! Tawk is completely free to use without any ads. Tawk generates its revenue by providing Hired Chat Agent services for customers that don’t want to answer the chat themselves. To use the software and answer yourself is completely free, with no limits at all on the number of Agents, Chat Volumes or sites that you can add widgets to. Awesome, right?! One of the main reasons businesses prefer Crisp over Intercom is its free plan which offers basic services including live chat and basic analytics. Even it’s pro plan, which is $25/month for four agents is not too bad provided that it has some neat features like automated triggers, user location map, unlimited chat history, and integrations such as Facebook Messenger. Crisp also has an integrated help desk which allows its users to help articles to from live chat and solve their issues by themselves. Crisp’s LiveChat is fairly intuitive, with rich media support for audio/video messages, GIFs, file attachments, and even an in-chat game! A video game to keep your visitors online when you are not online to reply to them! Pricing: Free, Pro: 25/month, Unlimited: $95/month. Helpcrunch wants you to turn your prospects into customers, drive sales, and improve retention with a rich toolbox combining modern live chat, in-app messenger, auto messages, ticketing, and email automation. This Intercom alternative allows you to understand individual customer needs to facilitate buying decisions at critical moments and encourage users to make the first purchase. HelpCrunch also supports the omni-channel messaging approach by bringing all your customer messages under one roof – be it email, via chat widget or social media. Businesses can even set auto messages to up-sell and cross-sell intelligently with personalized, custom-tailored offers sent an in-app message or by email. Pricing: Free for a single agent, $12/new agent added. Hassle-free live chat software for customer support and business growth. Collaboration and office productivity platform Zoho offers a web chat service to communicate with visitors in real-time, called ZohoSalesIQ. This Intercom alternative identifies customers location on your site and initiates conversation with them based on automated triggers generated by you. Users can even analyze through which source the prospects have entered your site and find what pages they are looking at. ZohoSalesIQ helps users create triggers and alerts by applying rules for automated messages when customers are stuck at certain pages. Zoho SalesIQ can be custom-build to align with your website’s branding with the ability to redesign the chat widget by personalizing your theme, welcome message, company logo and add an agent’s head-shot. Pricing: Free for 2 users. Pro: $7 /user /month with a 15-Day free trial. The latest addition to CRM service provider FreshWorks’ arsenal is Freshchat, a newer, shinier Intercom alternative aimed at sales teams. Freshchat wants to be the conversation platform for every customer journey- lead generation, customer engagement, and customer support. Just like the majority of Intercom alternatives out there, Freshchat kicks off by putting them bots to work and helping you qualify leads with triggered and well-crafted messages. Qualified leads are then taken care by your service reps, aided with important information like who your visitors are, their navigation path, behavior on your site, and more to make to make conversations that resonate. And with Freshchat’s integration with Clearbit, your marketing and sales reps can quickly know who they’re talking to without imposing any lengthy forms on your website. Pricing: Free for 10 users, Paid starts at 15/month/agent. Pricing: Free version lets you only have one concurrent chat at a time; Paid accounts start from 14/month. Much like Intercom, Olark focusses on providing a great user interface for both the business and the customer. Whatever your business goal — more leads, higher sales, or better service — Olark has the simple, functional live chat features to help you get there. With easy customization options, businesses can quickly make their chatbot match the entire aesthetics of your brand and provide a seamless experience to your website visitors. Olark also provides detailed live chat reports refresh in real time, so you’re always working with up-to-date info. With Live chat transcripts, Olark provides full access to your transcript archive, along with a user-friendly interface for searching, sorting, and filtering your way to the most relevant insights. Shared database of canned responses for quick, consistent replies. Pricing: Pro plan starts at 12/month/agent with a 2-week free trial. Customer service is king. With the advent of new customer communication platforms likes Drift and Intercom, customer service has gotten a whole lot quicker and easier. Since a whopping 63% of people would consider messaging a bot to communicate with a company, it’s no surprise that these customer communications platforms are here for the long run. Businesses are increasingly understanding the value of having quality customer service as more than 80% of businesses are planning to deploy some type of chatbot by 2020. Chatbots are expected to help cut business costs by $8 billion by the year 2022, businesses are in a hurry to hop on the bandwagon! Our advice? Try out either Intercom or any of the above-mentioned Intercom alternatives and lock one down as soon as you can. Don’t keep your customers waiting!